Back in 2005 at the Sundance Film Festival, The Duplass Brothers‘ “The Puffy Chair” debuted rather quietly here in Park City. At the time, the low-budget indie reminded many of the sort of sleeper that specialty companies would have quickly plucked from the festival a few years earlier, yet it took some 18 months before the film would eventually make it to theaters. This year, things seem different. 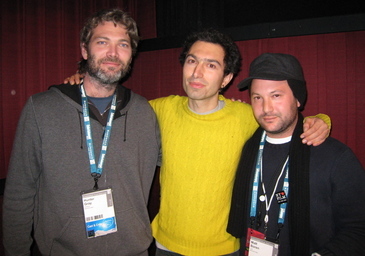 At a Sundance Film Festival in which buyers and audiences alike are seemingly rejecting a number of big-budget, star-driven films made outside the studio system, Jay Duplass and Mark Duplass‘ latest low-budget comedy, “Baghead” was quickly acquired for North American distribution just days after its Park City premiere. Competing against a number of other companies, Sony Classics swifty secured a deal for the film. The story of a group of struggling L.A. actors and filmmakers who head to the woods to conceive a DIY feature, “Baghead” at times mixes genres when the foursome are caught off guard as the weekend takes unexpected turns. Reflecting on their first two rousing screenings in Park City, Jay Duplass noted that the film played more distinctly as a comedy during its first showing at the Prospector theater, while two days later at the more intimate Holiday Village theater, some tense aspects of the story came across more distinctly. 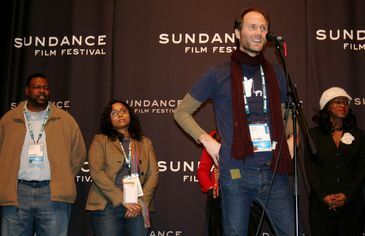 Director Lance Hammer speaks after the Q&A of his film, “Ballast.” In the background, (l to r) Actor Michael Smith, Producer Nina Parkikh, and Actress Tarra Riggs. Photo by Brian Brooks/indieWIRE. “Ballast” continued to receive positive word-of-mouth among Sundancers as the film screened again in front of a mostly full crowd at the festival’s large Racquet Club venue Thursday. Set in the rural Mississippi Delta, the moody feature uses first-time and rookie actors to present a portrait of sadness and struggle in the historically impoverished region. Twelve year-old James (Jim Myron Ross) struggles to occupy himself as his mother strives to earn a meager living. He seeks the attention of local teenagers who use him for their petty drug deals. One day, he drives his motorcycle to the home of Lawrence and cruelly robs the middle-aged man at gunpoint. Though on the outset it is difficult to fully understand what motivates his behavior, the dialogue suggests familiarity between Lawrence, played by Delta local Michael Smith, and James. Later, when James’ interaction with the local teens turns violent, his mother, played by Delta native Tara Riggs, flees their home at night and stays in a small house on Lawrence’s property. The complex relationship is slowly revealed against a backdrop of loss, hardship, poverty and emotional upheaval. “Momma’s Man” producer Hunter Gray, Director Azazel Jacobs and lead actor Matt Boren after the Q&A of their film. Photo by James Israel/indieWIRE. Along with “Ballast,” another intimate indie here at Sundance featuring non-professional actors — an intimate look at family dynamics — and a setting that also doubles as a main character is Azazel Jacobs‘ excellent “Momma’s Man,” which tells the story of Mikey, a young man who returns to the comfort of his parents and the home where he grew up instead of rejoining his own wife and newborn baby in Los Angeles.